Mieke Zilverberg, MA in Classical Archaeology, Greek and Latin Languages and specialized in Antiquities since 1976, University of Amsterdam. She has served as Chairman of IADAA and been a board member since the foundation of the Association. Also member of VHOK and CINOA. Mieke Zilverberg is the only dealer in the Netherlands specialising in antiquities as well as ancient coins. Since the founding in 1990, the gallery is showing a fine collection of archaeological objects from Egypt, Western Asia, Greece, Etruria and Rome, ranging from 3000 BC to 500 AD. Also on permanent display, Greek, Roman and Byzantine coins in very fine condition. Since 1984, Mieke Zilverberg is the Expert on Antiquities and Ancient Coins for the popular television program “Tussen Kunst & Kitsch”, the Dutch version of the “Antiques Road Show” in Great Britain. In 2004 Mieke Zilverberg received a Royal Award (Knight in the Order of Orange-Nassau) for bringing archaeology in scope of the major public. Exhibiting in the major international fairs of TEFAF Maastricht in March and PAN Amsterdam in November. 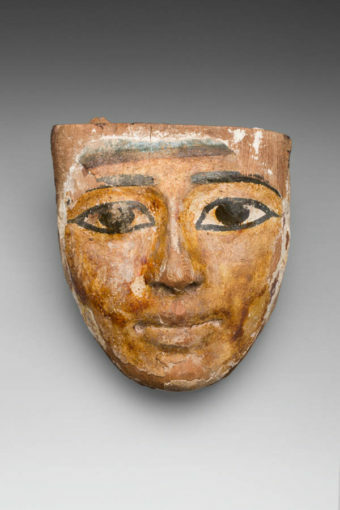 Ochre colored head over white gesso, with large almond-shaped eyes in black and white, black curving thick line for the eyebrows. Size: 15×12,5 cm. Some paint flaked off. Ex Vte Venduhuis, The Hague, May 2011.